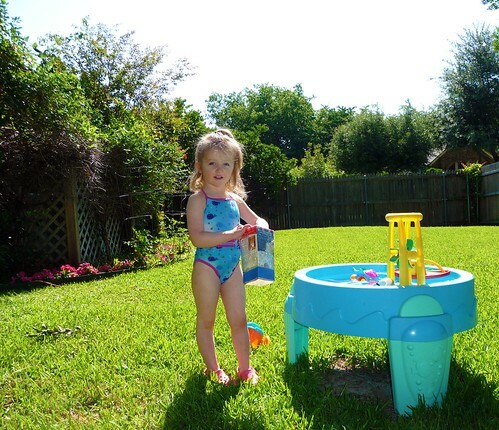 Were your kids just itching to play in the water throughout summer? My toddler was. And since we have recently been reading a book about ocean animals, we decided to make a quick and easy project to allow us to talk more about whats under the water. We made a Water Scope. And the good news is – it was so easy. Step 1: Cut the top and bottom off of your clean Milk Container. Step 2: Lay out one length of cling wrap under the bottom of your milk container, then pull it up until the long sides go just inside the top of your milk container. Do the same thing with your second length of cling, but this time lay it the opposite direction. That way the long part will cover the sides that had less cling cover before. Step 3: Wrap two rubber bands around the bottom of the cling holding the bottom nice and taught. Wrap electrical tape around it to secure it even more. And continue up the scope if you want to cover the milk designs. 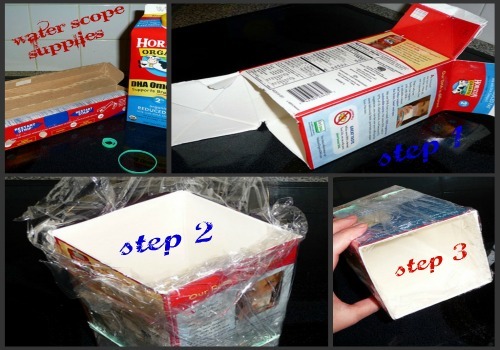 Lower the scope into the water plastic wrap side down. In a creek this would allow you to see minnows or tad poles swimming around! Because we were using a water table. I would let my toddler look through and see what belonged in the ocean, and what didn’t. So for instance- a clam. Yes! You find that in an Ocean! A little rubber bunny toy? NO! Bunnies don’t live in the water! Etc…. 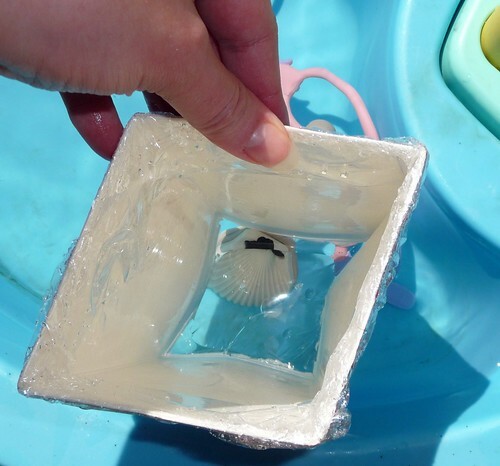 The scope would also work great in the bath or a small wading pool. We love the Water Scope. Hope you do too. The project was inspired by Donna Erickson’s book “Fabulous Funstuff for Families” and my daughters book “Three Little Mermaids” by Mara Van Fleet.